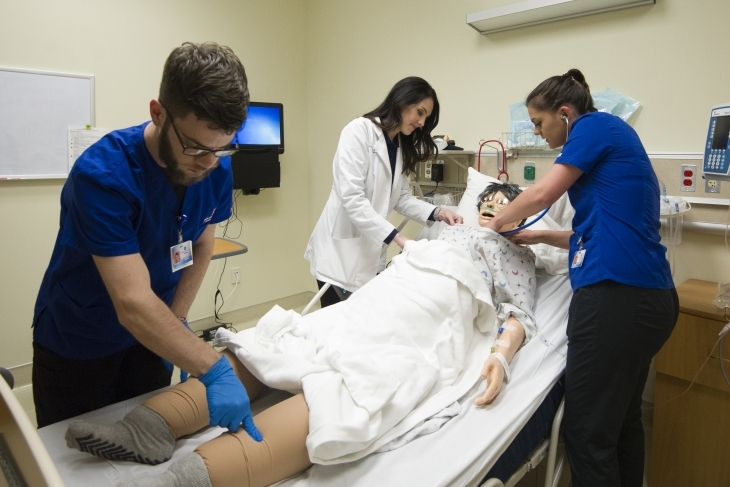 Every semester more than 400 individual nursing, radiologic sciences and respiratory care students engage in multiple simulation scenarios in Boise State’s College of Health Sciences Simulation Center. The College of Health Sciences Simulation Center has just received a renewal of their unique full accreditation in teaching and education and new accreditation status in research from the Society for Simulation in Healthcare. Boise State was the first to house an accredited simulation center in Idaho and the first accredited simulation center west of St. Louis, Missouri, not affiliated with a major medical institution. As of January 2019, there are 105 fully accredited simulation programs in 11 countries; of those, only 36 are accredited in research. Simulation is an immersive experience in experiential learning that allows students to hone their skills and reduce medical errors as they begin practicing in clinical environments. It provides students with the opportunity to experience low frequency, high stakes medical events, including airway obstructions, intubation and cardiovascular resuscitation. Students may practice skills on manikins or interact with standardized patients, actors modeling specific conditions or family member roles. Meanwhile, the students’ peers and faculty members are observing and preparing for the post-simulation debriefing. The debriefing is the key to the simulation educational model – where faculty and students discuss the scenario, the participating student(s) choices and performance, what went well, and ways to improve in the future. Accreditation requires simulation programs to demonstrate compliance with established core and area-specific standards. 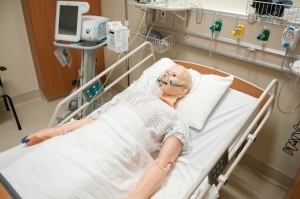 This ensures that students are engaging in a quality experience – from the oversight and administration of the simulation center to excellently planned scenarios and debriefing techniques. Accreditation in research assures that the center has established clear research procedures and infrastructure for faculty conducting research about and through simulation. 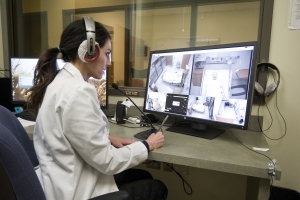 Currently the College of Health Sciences Simulation Center has researchers studying cognitive load, virtual reality learning, learner psychological safety, patient-centered care, and motivational interviewing. The purpose of the Society for Simulation in Healthcare is to serve a global community of practice to enhance the quality of healthcare. The society seeks to improve performance and reduce errors in patient care through the use of simulation. Established in 2004, society membership is 3,700+ strong—an international community of physicians, nurses, technologists, professors and other specialists advocating and implementing healthcare simulation in education, practice and research. The society fosters the improvement and application of simulation–based modalities such as human patient simulators, virtual reality, standardized patients and task trainers for all healthcare disciplines. The mission of the College of Health Sciences Simulation Center is to provide experiential learning and research opportunities for learners and faculty using state of the art technologies and best practices in simulation education. The center promotes the use of simulation in health science education to meet the needs for collaboration, communication and teamwork resulting in improved care, enhanced safety, and reduction of human error. Learn more at boisestate.edu/healthsciences-simulation.